Halloween retail spending was estimated at $9 billion in 2018. It's a little less than 2017's record of $9.1 billion. Slightly fewer, 175 million, said they would celebrate. They spent a record $86.79 per person, according to the National Retail Federation's annual survey. One reason for Halloween's popularity is that it's a very affordable holiday. It doesn't cost as much as Christmas or Thanksgiving and is still lots of fun. Part of this is a permanent shift to thrift that occurred during the Great Recession. Shoppers are willing to spend money on something if it provides a lot of value. Halloween does that. Another reason is that consumer confidence is at its highest level in 10 years. People aren't letting the uncertain state of the global economy scare them away. *Note: Not all of those celebrating are buying anything. That's why "Total Spending" is less than "Average Spending" times the number of "Americans Celebrating." Shoppers look to get a big bang for the buck, and Halloween delivers. What's the cost of a few bags of Halloween candy? Around 90 percent of Americans will buy candy, spending $2.6 billion. Almost 75 percent will purchase Halloween decor, spending $2.7 billion. The most expensive part of Halloween is costumes. Just under 70 percent of Americans will spend $3.2 billion on them. The top five costumes for adults were a witch, vampire, zombie, pirate, and Avengers character. The top five for children were princess, superhero, Batman, Star Wars character, and witch. More people, especially millennials, are buying costumes for their pets. Twenty percent will do so, up from 16 percent in 2017. The most popular pet costumes characters are pumpkin, hot dog, bumble bee, devil and cat (for dogs). The National Retail Federation hired Prosper Insight & Analytics for the survey. The company polled 6,961 consumers in September 2018. 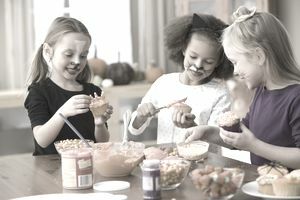 The purpose was to gauge consumer behavior and shopping trends related to Halloween spending. That helps the Federations' member retailers plan for the holiday. The consumer polls have a margin of error of plus or minus 1.2 percentage points. Halloween's affordability means that people are spending more now than even before the recession. In 2007, they paid $65 each. Per-person spending hit a low point of $56 in 2009, climbing quickly to $66 a person in 2010, and $72.31 in 2011. Here's another surprise: Shoppers spent more in October 2008 at $67 per person than the year before. Why did shoppers spend so much during a recession? They didn't realize they were in a recession on October 31, 2008. The economy had just started contracting. It was down 3.6 percent in the third quarter. Record Halloween sales statistics buoys retailers. It signals how well they'll do during the all-important holiday season. That's when about 20 percent of retail sales occur for the entire year. The kick-off is Black Friday, which is just a month later. In fact, 40 percent of shoppers begin their holiday shopping before Halloween. The retail industry produces 5.9 percent of U.S. gross domestic product. When it's up, so is wholesaling, which produces also 5.9 percent of GDP. Manufacturing contributes 12 percent. Retail sales are a reliable indicator of consumer demand, and that's what drives the U.S. economy. Strong retail sales make it more likely that the Fed will continue raising interest rates. The Federal Open Market Committee is always looking for signs of a healthy economy. Record-setting retail sales are a critical component. Is Your Credit Card Debt Higher Than Average? Why President Reagan Said Inflation "Is as Violent as a Mugger"